Elsa decides that even if people she likes have been shits on earlier occasions, she has to learn to carry on liking them. You’d quickly run out of people if you had to disqualify all those who at some point have been shits. Oh wow. 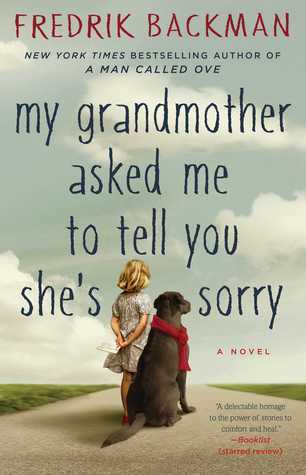 My Grandmother Asked Me to Tell You She’s Sorry was so good. It was sweet, funny, heartwarming, and sad. There was some good crying that happened while reading this book, but it was well-deserved crying. It’s told from the point of view of a girl named Elsa who is almost eight years old. Her grandmother, who really lives by the beat of her own drummer, is her best friend. Elsa has to deal with bullies at school, her parents who have divorced and both remarried, and the other people that live in her building. Throughout the book, Elsa gets to really know everyone in her building and how they all had some kind of relationship with her grandmother. I found it interesting that some people seemed off-putting or annoying when briefly described at the beginning of the book, but as Elsa learned more about them, there was something sympathetic and likable about almost all of them. Elsa was very smart for her age, which I can see some people might think that she had too much wisdom for that age and it wasn’t based in reality, but I disagree. With the way she was raised and her relationships with so many adults compared to not many kids her age, it made her more mature than she might have otherwise been. Also, so much of her perspective was still very much from the point of a view of a child and how she would understand what was going on around her that I never felt there were any false notes in how she talked, thought, or reacted to everything. I see this author has more published books. I plan on reading them since I enjoyed this one so much.